A packed public meeting at St Paul’s Church on Friday 27th January heard about a proposed development at Morrisons store on Brentford High Street and also plans for the Watermans, Max Factor and police station sites. The panel included Essential Living and Cllr Theo Dennison and the meeting was chaired by former councillor Andrew Dakers. Cllr Dennison admitted that Brentford is already suffering from lack of infrastructure. But then he surprised the audience by saying that the planning committee could not take account of the extra pressures on schools, hospitals, public transport or air pollution when deciding on the planning applications as they have to be decided on their individual merit rather than the cumulative impact. Otherwise the decision is likely to be overturned on appeal so planning can only seek compensation through a s106 agreement to part mitigate an application. Opposition turned to genuine anger when local residents surmised that Essential Living were building luxury flats at prices way beyond that which ordinary people on average wages can afford, such as the staff at the neighbouring St Paul's school. John Wright spoke out on behalf of the school, its parents and staff. Do read his speech in full. He said "Most of the families that leave the school before the end of the primary phase do so because of property. It is often families needing a third bedroom. " "Many of my younger teachers and staff simply cannot afford to live in the locality. I have young teachers who are unable to rent or buy locally. They commute in to school. In terms of recruitment and retention this is a real challenge". "Any development must serve the needs of the entire community. The proposed developments must surely compliment, not replicate one another and enrich the local environment, celebrating what is currently here. "Does the proposal for the Morrisons site meet that requirement? Not as currently proposed." Martin Case, Chair of Friends of St Paul's said "The proposed plans for the Morrison site if current proposal is granted will rip the heart out of the Brentford community for a period of at least two years and cause significant deterioration to the quality of life in the town for both residents and business. " Again, read in full. Denis Browne of Brentford Community Council supported the views already expressed and encouraged everyone to write individually to the Council. He was pleased that the councillors had turned out and were taking note. Denis also emphasised that residents needed to take the time and effort to get involved in having a say about developments as "this is our Brentford". The BCC meets on the second Monday of every month at The Griffin and is open to all. Friends of St Paul's Recreation Ground are asking everybody to comment on this application in the next fortnight before the officer's report is written which is expected to go to Planning Committee for a decision in March. Comments can be sent to planningcomments@hounslow.gov.uk and copied in to your local (Brentford and Syon ward) councillors. 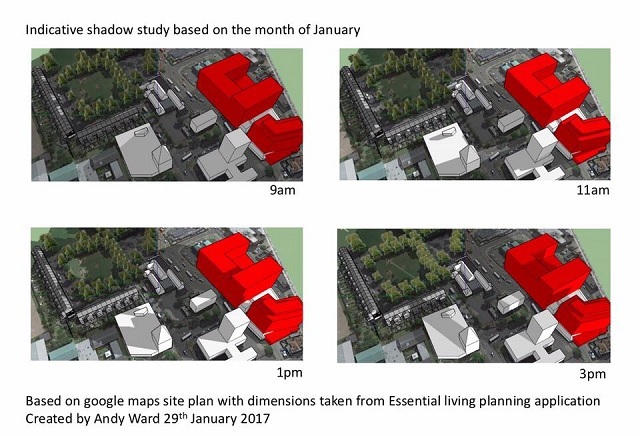 Essential Living's planning application is to demolish the existing supermarket and build a 10 storey high mixed use scheme which will provide a new supermarket and other shops/cafes served by a secure car park and include 225 flats for the private rented sector some of which will be available (25%) at rents at some discount to the full market rate. The Hounslow Local Plan calls for at least 40% of homes in new developments to be affordable. The supermarket will be of similar size to the current Morrisons, whose lease runs out in 2018. There is as yet no proposed solution to the need for a temporary supermarket during the construction period. The local plan advised a floor space ratio of 75:25 retail to residential use. 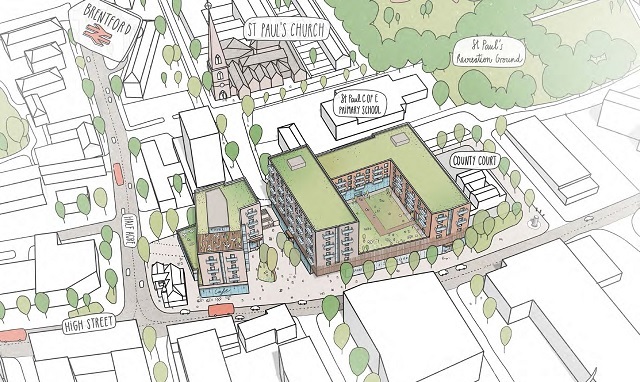 The development will include a piazza which will open up a vista to the spire of St Paul's Church. The expectation is that the planning application will be heard at planning committee next spring with a 18-24 month construction period starting next autumn.